Perform maintenance work at the service center and have them recorded in the vehicle data. The entries are like a service booklet of the documentation of regular maintenance. The entered maintenance work can be displayed on the Control Display. 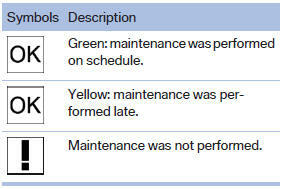 Function is available as soon as a maintenance operation has been entered in the vehicle data. Performed maintenance operations are displayed. 5. Select an entry to call up detailed information.